Unlike most aircraft traffic, pedestrian traffic inside the terminal is notoriously tricky to track and predict. It takes no time at all for congestion to build at ticket counters/bag drop areas or lines to form at security checkpoints. JFKIAT, the private company that operates Terminal 4 at John F. Kennedy International Airport (JFK), is leveraging technology to change this frustrating dynamic. The company uses a cloud-based software system to monitor and forecast traffic inside the busy New York terminal. Armed with predictive data, operations personnel can position staff and resources proactively to prevent backups at traditional pinch points. It also shares information with resident airlines, TSA and Immigration to help keep traffic moving. 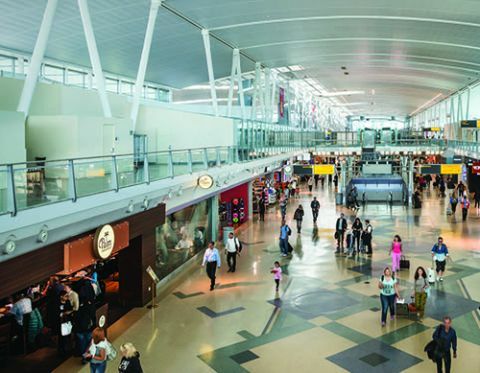 Instead of using static, cumbersome spreadsheets and charts with traffic information for a generic day, the software analyzes data drawn from the airport operational database, airline schedule changes and other more dynamic online sources, explains Robert Pyrka, director of airline and capacity planning for the terminal. That information is then combined with data about early and late aircraft arrivals, how long it takes passengers to move from one area of the terminal to another and the bottlenecks they might experience along the way. Results are displayed on a simple graph indicating precisely when wait times are likely to peak, he notes. The software and service that pulls it all together is called Operational Terminal Prediction from Beontra, a Leidos company based in Germany. JFKIAT paid a one-time fee for implementation, software customization, data integration and training; and will pay ongoing annual fees for licensing and support. JFKIAT has invested approximately $190,000 annually for software and licensing. Daryl Jameson, vice president of baggage and IT systems, notes that resource planning is especially critical in a busy environment such as Terminal 4. Each year, the terminal processes 21 million passengers and is currently home to 33 airlines. JFKIAT primarily uses the software to monitor and manage three key areas/processes: Immigration (Customs and Border Protection), the main checkpoint (TSA) and the security checkpoint for international travelers making a domestic connection. The tool predicts when passengers will show up at each processing point, based on arrival information and the associated walking distances and transaction times. The software tells Operations personnel how many passengers are expected to enter the queue, how many will be processed, how many will remain to be processed and what their waiting times are expected to be. “With this information, we are able to determine the number of positions we need to open in order to process travelers on a particular flight within a pre-established 60-minute period—from when the first person enters the hall to when the last passenger is processed,” explains Pyrka. The software bases its predictions on demand forecasting schedules, the terminal layout and current operations data. It begins examining passenger data one day in advance, and then amends its predictions as operational situations arise. Forecasts are drawn from passenger numbers and flight data enhanced with other data sources such as airline booking data and real-time wait-time data collected by queue measurement technologies. The resulting predictions are designed to serve as an early warning system, allowing terminal personnel to prevent potential bottlenecks and thus ensure a more pleasant traveler experience. The airport’s operational database updates flight information data for Beontra every five minutes. Every 15 minutes, the Operational Terminal Prediction (OTP) software generates a new calculation that takes into account, for example, early arrivals or flight delays and the number of travelers that must be moved to the next hour. In short, it keeps stakeholders informed about when passengers are going to show up, how many there will be, and what operational areas could potentially be impacted. JFKIAT has been using OTP software in Terminal 4 since August 2016. Before committing to the technology, the operator had Beontra run a six-month pilot program. Throughout the pilot, the company prepared schedule forecasts and capacity models for the terminal, then shared and discussed the results in a live environment with terminal management. FlightsStats data were used to integrate real-time information and allow operations management to accurately predict passenger flow throughout the terminal for the immediate hours ahead. 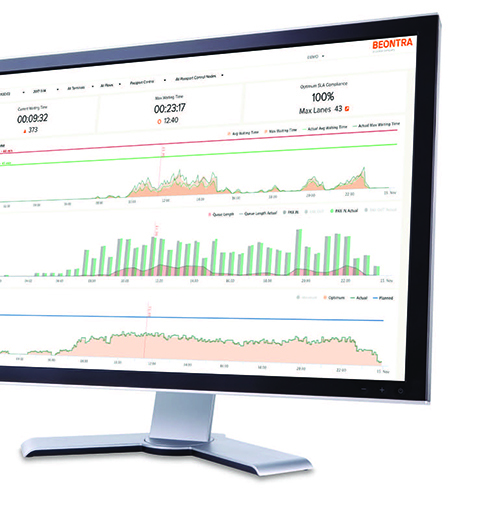 Beontra began the pilot by meeting with terminal management to establish “success criteria.” During the six-month period, Beontra’s product manager was onsite every six weeks to build the forecast and capacity model for the terminal. User training typically consists of four or more sessions lasting two to four days each, depending on the number of users, explains Beontra Sales Director Jana Skornicka. “The system can be used at a very high level for quick analysis, or it can provide airports with very detailed forecasts and reports, depending on the users’ requirements,” informs Skornicka. “’What-if’ capacity and resource planning are particularly important. For example, if the terminal initiates a construction project in a certain area, the system is able to show in a heartbeat how it will affect the rest of the terminal operations. By comparing forecast data with real-time data, operations managers can also improve future forecasts. Moreover, the operational dashboard on the computer screens provides users with what Skornicka calls one “forecast truth.” Working from the same data encourages joint decision making among all stakeholders, she explains. “The overarching goal is to improve the travelers’ experience and make the facility their hub of choice,” Skornicka summarizes.